Time to change the filter? To say the least. As a new ex pat in China, buying an air purifier could have been a real headache, but Smart Air helped immensely. I did my research and it made sense to choose SmartAir. It arrived quickly as it had to be shipped. A couple of days after using it a friend with an egg that reads air quality stopped by and honestly, I was concerned. Even told my wife perhaps we are better off not knowing because if we don’t like the results, what could we do? That wasn’t a worry because the results were better than expected. Phew. I know quite a few people who have bough purifiers since they moved here and I am 100% confident I made the best decision to purchase from Smartair. Some who already bough a purifier are considering buying a SmartAir because their more expensive machines are not cleaning their air nearly as well. I wanted to love this unit but overall I am disappointed and give it 2 stars. The Blast cleans the air very well but it is not quiet. I have a small, 2 bedroom apartment in Dalian, China and bought the Blast specifically thinking I can run it on low (quiet) mode. But there is a big problem. The Blast produces an annoyingly loud, electrical buzzing sound. How loud? It is very audible at low speed. For me and my wife, the buzzing is too loud to run the Blast at the low speed (quietest) setting, which is why we bought the filter. It is a shame because the fan speed at low is quiet but the buzzing is intolerable. If you have the TV or music on all the time (meaning you sleep with one of them on) its probably ok but we like quiet so no go. At medium speed, the fan does a pretty good job of hiding the sound of the buzzing. I can tolerate it at medium but if you are sensitive to noise pollution it will probably bother you. The fan at medium is a bit loud. Depending on your acoustics and lifestyle (ie you like a quiet house, you have many hard surfaces) you may not like it. At high you can’t hear the buzzing but for our size apartment that is too loud. Moreover, we bought the Blast specifically for the low/quiet mode. In short, if you buy this and you don’t like a buzzing electrical sound (and have an otherwise quiet place – meaning you aren’t always watching TV or listening to music), plan to run it at medium or high. Another problem related to the noise: I can’t run this in a 14 sq meter room with the door closed because at medium it creates too much circulation and at low I hear the irritating, buzzing, electrical sound. For a single bedroom that is 15 sq meters this unit is too strong unless you can tolerate the low speed buzzing sound. Perhaps I have a defective unit. If not, I am unhappy with this unit and feel the claims of it being quiet are misleading. SmartAir does a great job of being transparent, which is a rare thing, but in terms of full disclosure on noise for this item they dropped the ball unless, of course, I have a defective unit and they can replace it (then I would be thrilled and give this 10 stars). If I knew this about the product, I would have kept looking or maybe bought the mini Blast. At the moment, I sort of feel cheated. I invite Smart Air to fix this problem and, in the meantime, inform customers about this issue. What about the air quality? On the upside, the filter a superb job of cleaning the air. I don’t have a particle counter but my lungs want to take a deep breath for the first time since I’ve been in China. Note: I don’t have the carbon filter because Dalian air is bad due to PM (not gases) and I don’t have new furniture/fixtures, etc so no off-gas. I find the unit costly at 1,980 yuan (~$310). It is the same as competition except for the Xiaomi, which I didn’t consider because it is too loud. But I wish SmartAir was pushing the envelope on price for all their units and not just the DIY option. It is bulky and heavy but comes with great wheels and it looks pretty nice. It also sports a quality electrical cable but I wish the cable was a couple feet longer. Hi AK, Paddy here from the Smart Air office in Beijing! Thanks for writing the long review and giving us all this useful info. It sounds like your biggest concern with the Blast is with the noise levels. All air purifiers have motors in them, which are what typically give off the most noise. 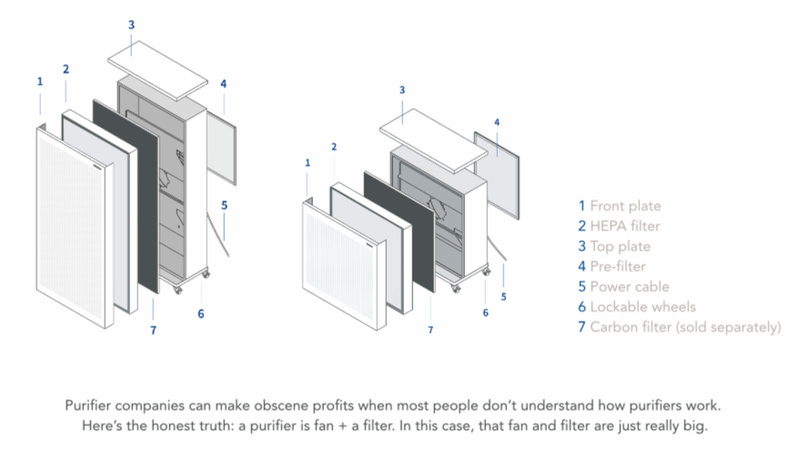 If a purifier seems to be totally silent (like some purifiers when in sleep mode) then it probably means it isn’t doing anything to clean your air. We tested the Blast in 2 different labs for noise, and the numbers above show it’s much quieter than other purifiers out there. Having said that, everybody has different perceptions of noise and some people are more sensitive, if the noise is really a problem then it might be hard finding something that will work right for you. We run 2 Blasts in the Smart Air office constantly, and it doesn’t affect our work. In fact we all like the ‘whooshing’ noise – it reminds us we’re breathing clean air! Whether or not the Blast pushes the envelope on pricing can be answered by looking at the cost per effectiveness of this purifier compared to other purifiers. The ‘bang for your buck’ of this machine is still much much higher than other similarly priced machines (we’ve worked hard to pack as big a HEPA as possible into the machine whilst still keeping the costs down). Similarly priced machines may only have a CADR in the range of 300-400cbm/hr, whereas the Blast has a CADR of 890cbm/hr. We also did make a conscious decision when designing the Blasts to go for a better finish and higher quality than previously (for example, coating the whole machine in white paint as opposed to leaving parts as ‘bare metal’, or sourcing a bigger/more effective HEPA filter and carbon material). These things have definitely brought the costs of the machine up, but we did work very hard to get the balance between cost and quality right for the Blasts. Awesome reply. My wife and I are so happy. We are tickled pink that we this unit will be truly silent! It is a sign of what I felt to be true about SmartAir. Mistakes happen so its the response that is the measure of character. A company that quickly takes responsibility for mistakes is rare and commendable. Regarding pricing: I appreciate the detailed response. Overall, we are satisfied, and this Blast clears air really well. Its a good product. but this is nowhere near “really quiet” or “hardly notice the Blast when running it”. The first one, we could hear high tone buzzing sound, and sent an email about it. someone from the company said he went ahead and shipped a new one to us. fair enough. It arrived the next day. I would like to mention that, If you are okay with Chinese language, probably better to buy smartair products through taobao. I bought it from this website. It took time for me to get a reply by email, wasnt sure where to contact. called the number listed on the website, they first couldn’t locate my order, and I was bit worried. taobao is more straight forward about where to contact, order#, when it will be shipped. Paddy here again, from the Smart Air Beijing office. Everybody is different in how sensitive we are to noise, and it sounds like the Blast might just be past the threshold for you. Bear in mind that if other purifiers are very quiet, it means that they’re probably not doing much to clean the air. 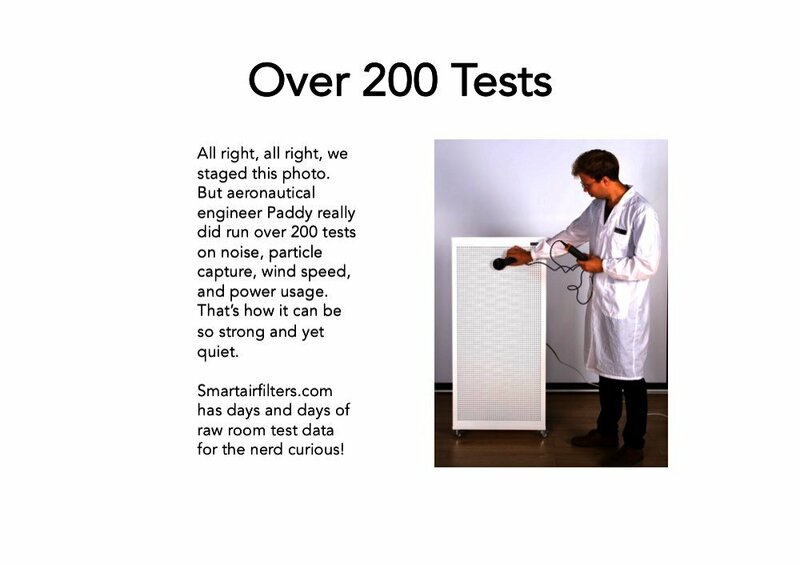 We’ve run tests on air purifiers in sleep or mode like the Xiaomi and Philippes. They’re normally very quiet in these modes, except the problem is they’re not effective at cleaning the air in these modes. We’ve tested the Blasts in two labs and the raw data shows that the decibel level of the Blast is lower than others (like the Blue Air and IQ Air), but as I said noise is very subjective. You’re right that if you’re comfortable with Chinese, Taobao is certainly the simpler, most convenient way for getting hold of a Blast! Of course, we need to make sure those who can’t speak Chinese can still breath clean air in China and get hold of it affordably. Esther – who manages our email – is based in the US so you’re right that there is sometimes a bit of a lag getting responses by email. We’re a small team trying to change a lot, and we’ll look at trying to improve this process! I strongly suggest to include a lower speed mode which makes less than 30db. Having a minimum mode of 38db, despite its EXCELLENT CADR, it is not very convenient to run in a bedroom or for a study room / home office while sleeping/studying/working inside that room. Hey Carlos, Paddy here – I designed the Blast and Blast Mini. That’s a great suggestion for getting the Blast and Mini even quieter! On low, the Blast’s CADR is 507cbm/hr which you’re right – is crazy high! That’s almost 2 Xiaomi’s on their maximum speed, when they’re extremely noisy (67dB)! Having said that, for smaller rooms of 30-40sqm, then a CADR of 507cbm/hr is still well above what would be required (a CADR of about 300-400cbm/hr), so your option of another speed which is slightly slower and as such quieter is a great idea. I’ll look into making this a reality. Great service, delivered promptly before expected. Seriously notice the difference when I plugged it in and it is only summer. These are awesome. We have one in our bedroom at full blast constantly and have never considered it loud at all. We watch films fine and don’t even notice it. And we sleep in perfectly clean air… seems like a pretty good deal to me! Thanks guys! We love the Blast. Our particle counter reading is now 0 or 4! A wonderful peace of mind to finally have clean air in our home in China. It is indeed a big unit so finding the space was a little tricky and the fan blows a lot of cool air so we need to turn it around when sitting near it. Will be welcomed in summer! 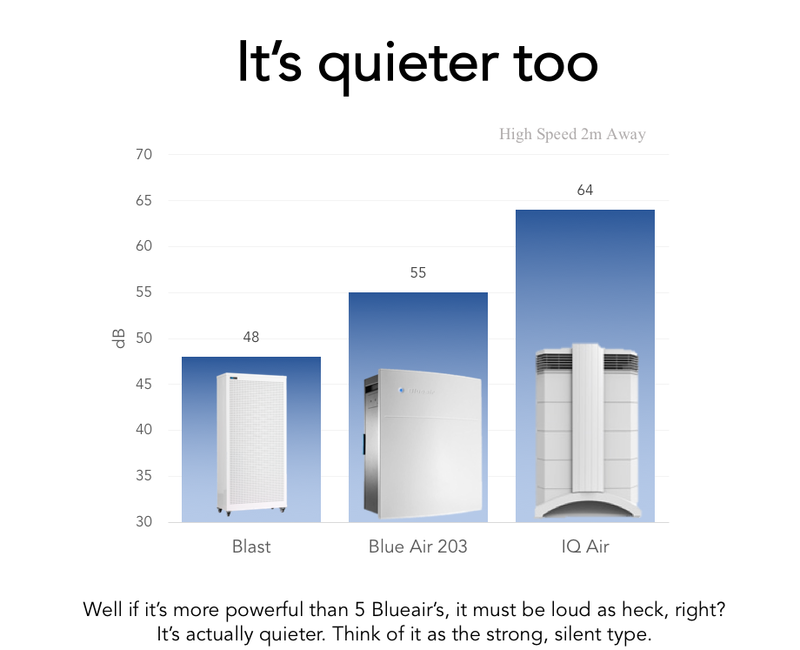 We are not bothered by the noise definitely quieter than Xiaomi and the Smart Air Cannon.